Finally, Long awaited Apple iPod nano has arrived in the stores. There is no doubt Music Junkies love Apple iPod, why not if there are so many reasons for it. The stylish sleek light Apple iPod nano features multi-touch gestures, Genius Mixes, shuffle, live radio, new VoiceOver technology and more. iPod nano has a built-in FM radio that lets you even play, pause and rewind your music tracks. iPod nano is now available with 8GB and 16GB of storage. 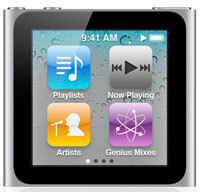 Apple iPod nano's multitouch is the same technology which is incorporated in Apple iPhone, iPad and iPod Touch. The multitouch feature lets you control your music tracks and other functions just a tap or swipe away. You can use two fingers to rotate the display and you can also customize the home screen icons the way you want. The small 240 x 240-pixel screen is enough to display your favorite wallpapers, album art, photos and more. Use the 30-pin connector to plug iPod nano to your car stereo system, speakers at home, your Mac or Windows PC, iTunes and play loads of favorite music tracks. The new VoiceOver technology also seen on iPod Shuffle reads out the screen, track name, description, artist and more. Shake your iPod nano and it plays a song randomly, which you never listened or have forgotten. The Live FM feature actually records the current FM station track so you can pause and play and rewind the track for 15 minutes. You can recontinue listening to the song from the point you left. The Genius button randomly creates a song playlist and you don't know the next track. The Song combination will always surprise you. The Built-in pedometer you can keep track of your walking exercise. Make a goal and analyze your daily growth on Nike Website. There is also a Nike + iPod Sports Kit (available separately), lace it up with your Nike shoes and get songs played according to your workout mood, your exercise condition and more. Fill your iPod nano with the latest music, podcasts, audiobooks, and songs with iTunes. There are about 13 million never-ending songs available at Apple's online music store iTunes. Song, album, and artist information can also be displayed in Bulgarian, Serbian, Slovenian, Ukrainian, and Vietnamese. Apple iPod nano is now available in Apple stores with the price tag of $149 (US) for the 8GB model and $179 (US) for the 16GB model. Pretty Expensive!! 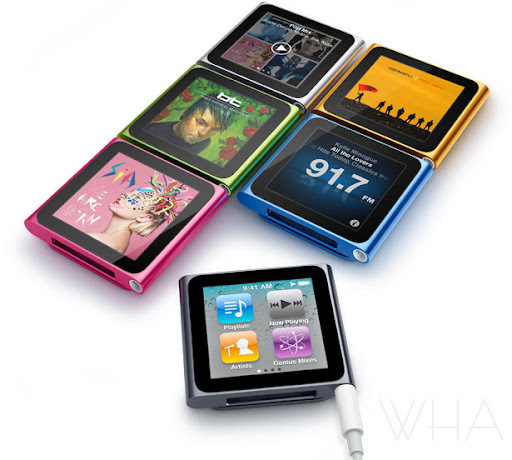 I think the iPod nano is over priced, Go for it if you are crazy rich about music and apple gadgets. What do you think? Did you like the iPod nano? Share your opinion with us in the comment section below. Apple is the really boss.